Tenderstem broccoli is a hybrid of Chinese kale and broccoli which was first introduced in Japan in 1993. Chinese kale is a leafy brassica with long stems that it lent to the broccoli, resulting in a broccoli floret with a stem that is totally edible, even when raw. As a hybrid of two superfoods, tenderstem is high in folic acid and vitamins A and C – gram for gram it contains more vitamin C than oranges. 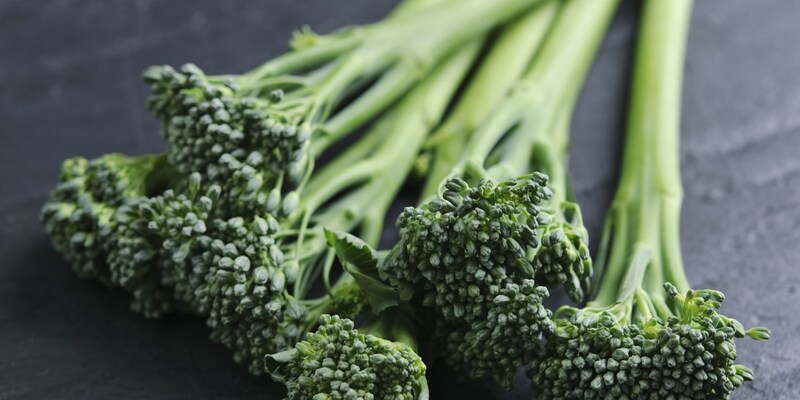 Originally tenderstem was grown in warmer climates such as Kenya and Guatemala, however, in 2010 farmers began to grown it in milder regions of the British Isles – fifty per cent of the tenderstem broccoli consumed in the UK now comes from Hampshire and West Sussex. It is harvested from June until November with the peak of the season falling in September. When buying tenderstem broccoli look for firm stems and crisp florets. It will keep in the fridge for up to five days but is best eaten within two days of purchase. Tenderstem does not need to be peeled or trimmed before using and as tenderstem is much more delicate than regular broccoli, it takes only a matter of minutes to cook. It can be boiled or steamed for no more than a couple of minutes or thrown in as part of a stir-fry. You can also roast tenderstem in a hot oven with a good drizzle of olive oil. Tenderstem is also great eaten raw, try adding it to salads for extra crunch or using as a crudité with a bowl of hummus or tzatziki. Tenderstem broccoli is delicious as part of a Chinese or Thai meal, the flavours of chilli, garlic, soy and ginger complimenting it wonderfully, especially when stir-fried. Another great combination is broccoli with anchovies, shallots and toasted almonds; try serving this mix with roasted lamb or as a salad with a good glug of olive oil and flaky sea salt. James Mackenzie uses tenderstem as part of his Winter greens with walnut butter and Marcus Eaves serves it with his Monkfish tail with blackened spices. Paul Foster makes an occasion of his Charred tenderstem broccoli, serving it with Cerney ash goats cheese, quince terrine and hazelnuts.